Jessica and Kevan start out with a guide dog placement update. Kevan gives a blog update. Brooke has contributed a blog about Kambucha Tea. The WE Team welcomes Lyn Harwell to Find Your fit. Lyn is one of the founders of One World Everybody Eats (OWEE), Founder & CEO of Seed’s Community Café, community activist, and amazing friend. Lyn talks about his journey and how he ended up here in Colorado Springs fighting for healthy food for everybody. He tells what “nutritionally vacant” food is and that most of the food people in lower socio-economic backgrounds have access too is nutritionally vacant. 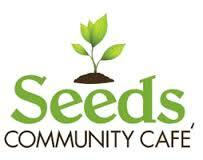 Lyn tells what the Seed’s Community Café stands for and does in and for the community. Seed’s is a nonprofit community café, which someone can come in and either pay for their meal, pay “extra” for their meal (so someone else less fortunate can have access to nutritional food), or contribute their time and work for a healthy meal. Lyn tells about “food insecurity,” which the state of being without reliable access to a sufficient quantity of affordable, nutritious food. Seed’s also provides nutritional cooking classes, job training, and catering. Lyn tells us ways to reduce our food waste. The EPA has the Food Recovery Challenge, which challenges people to reduce their food waste and gives tips to do so. Lyn tells that Seed’s has gotten over 40 people back into living wage jobs since they opened. If you want to help support Seed’s here are some links below. One World Everybody Eats (OWEE) is the umbrella over Seed’s Community Café and over 70 other community cafes all across the USA. You can find a café near you at the OWEE website. In Fit Chat, Jessica & Kevan discuss the “neti pot.” The neti pot is a tool used for nasal irrigation. Here is what WebMD says about the neti pot and nasal irrigation. Your Job – Tell us some of your yips, tricks, or recipes to keep your fresh foods from going to waste.